Dogs and humans have a special bond, but there is also something special about a dog’s love for chasing and returning objects to their owner’s hands. Fetch has been a sport that humans and dogs have shared for millennia, and it would be a shame if you missed out on this special activity with your best canine friend. Perhaps due to a physical limitation or injury, it might be difficult for you to give a mighty throw that sends your dog sprinting off into the distance. You wouldn’t want to let your dog down with a mediocre throw, but don’t worry; nowadays, you can just get yourself a dog ball launcher to assist you. No matter what’s holding you back, now your dog has a way to play fetch and get some additional exercise even if you’re not able to. But which ones should you get? 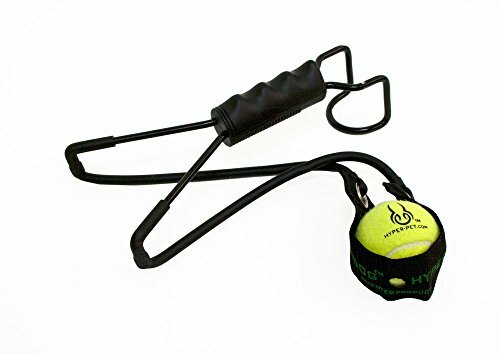 In this review, we’ll be covering the best automatic dog ball launchers as well as manual and semi-automatic products so that you can find the ideal product for your fitness level and budget. We’ll be covering the most important factors to consider and give you our top choices for each category. It’s about time we got to reviewing some products. Since there are three types of launchers: manual, semi-automatic, and fully-automatic, we’ll be reviewing a variety of products that fall under each category so you’ll have lots of options to choose from. The iFetch Too is a major upgrade from the original flagship product. It is a slightly larger product which is capable of launching standard 2.5” sized fetch balls. If you’ve seen the original, which is slightly smaller, you’d realize that some of the iFetch balls could be a choking hazard for bigger dogs. In addition to handling larger fetch balls, the launcher now has an adjustable distance of 10, 25, 40 feet, or random. The new “random” feature is a breath of fresh air; it adds a new dynamic to the activity and keeps the dogs guessing. When playing outdoors with lots of room, this is the ideal setting to use. Lastly, the iFetch Too comes with a built-in rechargeable battery so you don’t have to worry about carrying around a cable to use it. The iDogmate has two versions: the larger one can fire standard 2.5” fetch balls, and the smaller one can fire 1.5” mini fetch balls. 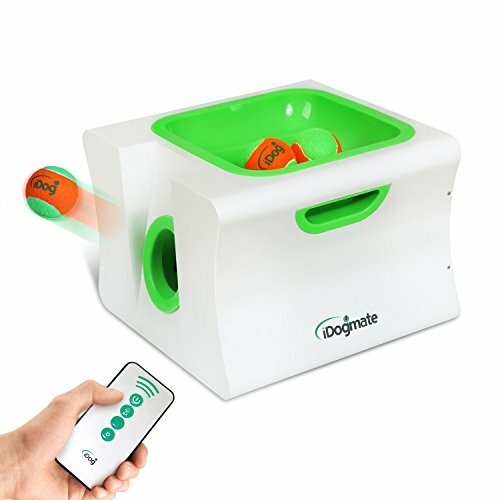 iDogmate is the only alternative to the iFetch when it comes to having products on the market that can support almost any type of dog’s needs. For instance, the iDogmate launcher has a wide range of distances covering 10, 20, 40, and even up to 50 feet. This is perhaps the product that can launch fetch balls the farthest out of all the automatic products on the market. It comes with a handy remote control so you can manage it from afar. If your dog seems to have an endless source of energy, then perhaps you can use the iDogmate to put his stamina to the test. The original iFetch is suitable for smaller to medium-sized dogs and shoots 1.5” mini fetch balls at distances of 10, 20, or 30 feet. 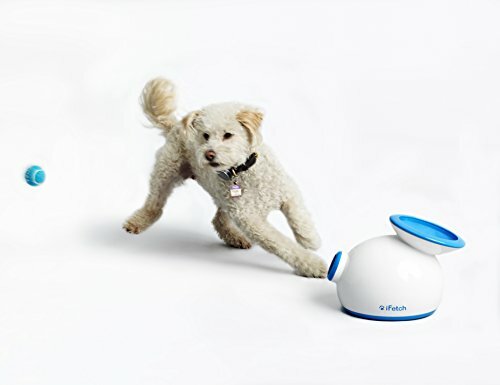 Since the launch distance is adjustable, the iFetch is great for both indoor or outdoor use. 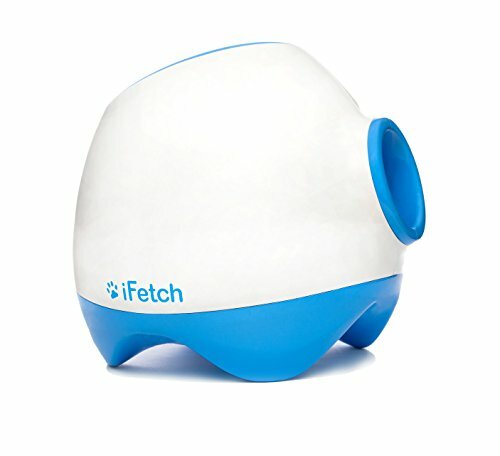 This versatility along with its unique design allowed iFetch to be the top product for many years, and to this day it is still a fantastic option for your dog. Lastly, it includes a variety of toys that dogs seem to love. Out of all the products out on the market right now, the SmartPult is one of the most innovative and unique ball launchers available. First, it is app-enabled, allowing you to control the device from your phone’s interface. Second, it dispenses treats while also engaging your dog with an interactive game of fetch. All of this can be controlled from your smartphone, so you can choose when to reward your dog for being a good boy, or you can simply adjust the launch distance of the balls. The SmartPult can operate on battery power or with the included AC charger. As with most launchers with adjustable distances, it can be used indoors or outdoors. Unfortunately, the SmartPult can only support mini fetch balls, so for owners with large dogs check out the other options mentioned above. For owners who want to have a more active role when playing with their dog (or just want to look cool holding a ball cannon) and want to save on some cash, then check out semi-automatic launchers. These products come with nifty features such as the ability to pick up balls and load the gun without your hands ever needing to touch a ball covered in dog slob, or the ability to fire fetch balls huge distances like a Nerf gun would with pellets. I’m convinced that the Nerf Dog Tennis Ball Blaster was designed by a sadistic engineer who originally wanted a gun that fired tennis balls at people, but was told that it was too dangerous so it was later rebranded as a dog ball launcher. Either way, Nerf came out with a gun that can shoot tennis balls really long distances, and that is just the thing you need for playing fetch with your dogs. 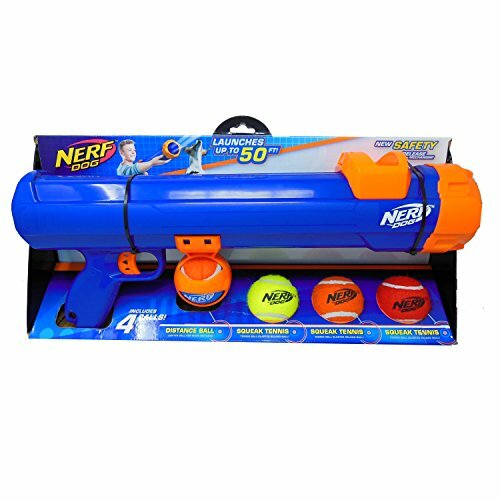 This product is one of my favorites as it has a hand-free ball loading mechanism, comes with four standard sized Nerf tennis balls, and the pump-action mechanism allows for easy loading of the ball. The firing distance of this gun is around 50-60 feet on average. 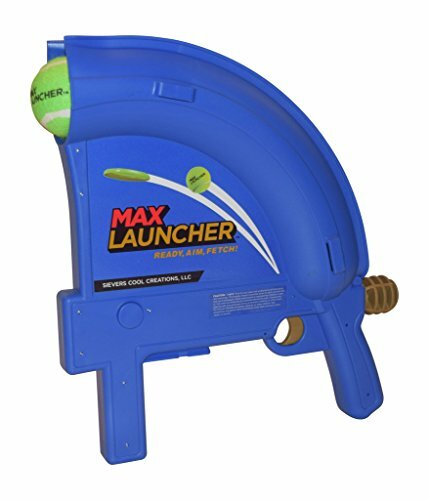 Next up on the list is the Max Launcher, and it is a product that can not only launch fetch balls, but also discs. While this makes the product somewhat pricier, its versatility more than justifies the increased price. The Max Launcher allows for hands-free pickup but does not have any space for storing additional balls. The distance of the launcher can be adjusted through the tension knob located on the back. Speaking of distance, this is one of the most powerful handheld launchers, capable of firing tennis balls up to 90 feet and flying discs up to 120 feet! Due to the arc that the ball travels at and along with its power, we recommend using this launcher outdoors only. The Chuckit! ball thrower is a classic for dogs and dog owners that love to play fetch. With the assistance of this tool and a strong arm, you can throw fetch balls farther than even an automatic launcher. It is best used outdoors where there is lots of running room. Using the Chuckit! classic launcher, you can probably increase your throwing distance by 2-3x. It even provides hands-free pickup so you don’t have to touch a slobbery ball with your bare hands. It also comes in numerous sizes and colors. While it may take some getting used to, once you’ve mastered using the Chuckit! launcher, you will have a powerful throw that can quickly tire out even the most energetic dogs. The Hyper Dog Ball Launcher is capable of throwing balls well over 200 feet in any direction. Just like the Chuckit, the Hyper Launcher allows for hands-free pickup and in addition to that, eliminates any shoulder strain from tossing the ball. Unfortunately, this product is bulkier in comparison and is a bit more expensive. It is difficult to best the Chuckit! in the manual launcher category, however this is a great alternative for dog owners who want a change of pace for playing fetch with their dogs. It would be remiss of us to tell you about all these launchers but nothing about the fetch balls that is required to use them with. Even though some brands come with their own balls, they may not necessarily be the best option. Or, if you simply want more buying options, we cover some below. These balls are much more durable, softer, and more saliva resistant than traditional tennis balls so we highly recommend them. Chuckit! Ultra Ball: The top-selling, gold standard of canine fetch balls. It is made of non-toxic natural rubber that allows them to travel far and bounce high. They are also buoyant, so they can be used in the pool or pond. They are available in three sizes that can work with Chuckit! and launchers from other brands. KONG Squeakair Dog Toy Tennis Balls: This ball can make squeaking noises when squished, which your dog will hopefully love. It is also made from a rubber-base and covered in a synthetic felt that is high-quality. They can also float and are available in a variety of sizes. Snug Rubber Dog Balls: Made from 100% natural rubber, available in many colors and are easy to clean – those are what describe this popular fetch ball. They can float in water and are available in two sizes. What to Consider When Looking for a Dog Ball Launcher and Thrower? Manual Launchers: These are most affordable of all the launchers and is optimal for outdoor use. Their small size and light weight makes for easy portability so you can take this with you anywhere you’d like to play fetch with your dog. Of course, a manual launcher requires some physical exertion on your part, but with some practice you can toss a ball as far as 130 feet! The wand type of launchers is very popular as are the slingshot variants. If you have no physical limitations (which may happen due to age or injury) and want the most active and budget option, then manual launchers are suitable for you. Semi-automatic Launchers: This type of product is essentially a gun for fetch balls (think NERF guns on steroids). They are not as durable as their manual counterparts but have respectable launching capability and require much less effort on your part. Due to their (gun shaped) design, they are most popular with kids. Automatic Launchers: The most recent type of ball launcher are automatic launchers. They are designed to be self-sufficient and can provide your dog with hours of quality entertainment with almost no input required from you. Essentially, your dog can drop the ball into the machine’s receptacle and it will launch the ball great distances automatically. They can also be used both indoors and outdoors. Unfortunately, they are the most expensive out of the three options, and you will have to train your dog to use the machine. Thus, depending on your physical condition and budget, you can select the type of launcher that best suits your situation and preferences. Another consideration when selecting a ball launcher is the breed and age of your dog. A small ball can accidentally get lodged in your dog’s throat if he is a larger dog. Conversely, a small dog may have difficulty grabbing a ball in his mouth which can potentially harm his teeth and jaw. With that in mind, all launchers can support the standard ball size of 2.5 inches. This is the ideal range for use with medium-sized breeds like the German Shepard, Labrador, Retriever, Great Dane, and Mastiff just to name a few. Smaller launchers are suited for use with balls around 1.5-2.0 inches in diameter. Furthermore, your dog’s size matters because a larger dog can also handle running larger distances and vice versa. If your launcher can only toss the ball 20-30 feet, then a larger dog will be sorely disappointed, but a smaller dog may find that to be an ideal distance. Whether you are playing indoors or outdoors, playing floating fetch or dry fetch, with only a single dog or a group of dogs, the type of playstyle you prefer will affect the type of launcher you choose. Manual launchers are better suited for outdoor play with a single pet. Furthermore, since manual launchers do not have any electronic parts, you can use them to play fetch even in the rain or other wet conditions (only if you want to put yourself through it). On the other hand, semi-automatic and fully-automatic launchers can only be used in dry conditions such as indoors or outdoors in sunny weather. Unless you are living in the desert, the outdoors is never fully dry but most launchers can withstand exposure to some moisture. Higher quality products give you more control over the range of the throw, so you can calibrate it to work with indoor play as well. Lastly, automatic launchers can launch multiple balls rapidly, so it is suitable for playing with multiple pets simultaneously. The next thing you ought to consider is the construction quality of the product and its form factor. Most products should be designed with high-quality plastics that can withstand outdoor use. When it comes to design, manual wand launchers should have excellent flexibility, length, and be light weight. Typically, the longer the launcher, the further it can throw the ball. In a similar vein, heavier ones can also increase throw distance. For slingshot style launchers, you will want to consider the durability of the rubber sling. For semi-automatic launchers, keep an eye on the durability of the spring and quality of the recoil lever. When the recoil lever is pulled back, you will experience some pushback on your shoulder when firing the device. Ideally, you should look for a launcher that uses a pump action without any exposed firing/lever mechanism. Lastly, for automatic launchers, look for ones that can fire with precision and has reliable auto-shooting components. It is imperative that the launcher has a ball sensor to stop the motor from working and heating up even when there is no ball to launch. There are just a few things left to consider that may sway you to choose one product over another. One such consideration is how many fetch balls is included with the launcher. Obviously all of them come with at least one, but many that are covered in this review come with two or more. This means you already get a set of fetch balls and do not have to worry about purchasing more. In addition, if you care a lot about the aesthetics of the launcher, then you may wish to choose a brand that sells their products in a wide selection of colors. Play fetch with your dogs in style! Lastly, you should also consider the service support and warranty that the manufacturer provides for the product. Nearly all the products we cover in this review comes with a 30-day satisfaction guarantee. Automatic launchers are typically covered by an additional six to twelve-month warranty. Popular brands like PetSafe, Hyper Pet, iFetch, and ChuckIt! have a reputation for excellent customer service that will help you resolve any issues you have with your purchase. Especially in the case of high-end products like automatic launchers, you want to make sure your investment is protected. Keep all of these considerations in mind when choosing the optimal product for you and your pets. Before you get started using a ball launcher, there are some precautions you should take so that both you and your dog have a positive experience. We outline these important factors below. Make sure your dog is obedient enough to follow basic commands. He needs to be able to fetch the ball and return it to you. It would be quite cumbersome if your dog wandered off each time. Thus, you should first play fetch in an enclosed space such as in a fenced yard or indoors. Next, pick a ball that is the right size and diameter for your dog. The standard 2.5” fetch balls are better suited for medium to large dogs. Smaller dogs should use 1.5” balls. A ball that is too large can be hard on your dog’s jaw, and a small ball can be a choking hazard. You can consult with other dog owners (feel free to go online if you don’t know any personally) to get a reference point for what is too large or small. While teaching your dog how to fetch, be patient and calm. Only throw the ball a small distance and encourage your dog to retrieve it. Use treats to reward your dog and encourage them. Positive reinforcement (with treats!) is the best way to help your dog to stay calm and learn. To start, use a soft rubber ball or a Frisbee (even cheap stress balls can be an option). These should be soft on your dog’s teeth and gums. Standard tennis balls can actually cause issues since the synthetic felt can be ingested, and the ball will absorb your dog’s saliva. Tennis balls that don’t fit the ball launcher’s specifications may even cause damage, especially if it is automatic. Once you are comfortable with taking your dog out, make sure you play in dog parks or wide open spaces so you can play fetch without bothering other people. If you want to play indoors or in fenced off areas, consider using a semi-automatic or automatic launcher and set it to launch the shortest distance. After every session, clean the ball with soap and water. If it is getting worn out, replace it and get new ones. Do not share the same ball with dogs that are not your own since it may spread an infection. Manual launchers can and should be cleaned and air-dried. Semi-automatic and automatic launchers cannot be washed. The preferred cleaning method for them is to shake them down after use and leave them out to air-dry. A moist towel can be used to wipe the surface. This is not a comprehensive guide but it should give you an idea on how to get started. Be sure to check out other guides if you have questions. Fetch and throw is a wonderful bonding activity between a dog and his owner. Look at any dog park or backyards of dog owners and you’ll probably see a loving canine companion having a blast playing fetch with his owner. With the help of a dog ball launcher, you can enhance that experience even more. In our review, we looked at some of the best dog ball launchers and throwers out in the market today. We’ve covered the three major categories of launchers: manual, semi-automatic, and automatic. We’ve listed our top picks within each category and gave a brief explanation of why we think it deserves a spot on our list. Now it is up to you to decide which product is most suitable for you and your dog. Finding the perfect product may seem like a difficult task, but the look of elation on your dog’s face the next time you play fetch will make you realize it is all worth it.